Advances Powering Services INC. provides the most reliable and technologically advanced power solutions for Cable TV, Broadband Communication and Data Networks worldwide. Alpha’s comprehensive installation, preventative maintenance and repair programs complement a diverse line of innovative and cost-effective power products including: standby, non-standby and uninterruptible power supplies, surge suppressors, enclosures, batteries and accessories. From ground-breaking transformer design improvements to the integration of the most intuitive and user-friendly interface in the industry, the Alpha XM3-HP CableUPS® incorporates significant technological advancements across the entire power platform and sets the new standard in intelligent power management.The Alpha XM3-HPs patent-protected Advanced Ferro Technology optimizes the ferroresonant transformers performance, providing ground-breaking efficiency ratings, improved protection levels and the tightest output voltage regulation ever offered. This next-generation power supply features internal intelligence capabilities that provide Network Operation Centers with the critical and highly relevant data necessary to reduce operating costs and optimize the power component of the network. Additional features include Advanced Battery Management which can increase battery life by 20 percent, reducing both capital expenditures as well as ongoing operating costs. 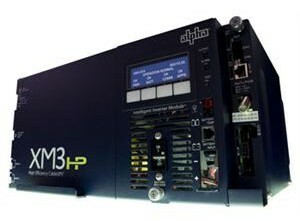 For a comprehensive resource page complete with XM3-HP datasheets, manuals and training videos, please visit http://www.alphaxm3.com.